The physical volumes are combined into logical volumes, with the exception of the /boot partition. The /boot partition cannot be on a logical volume group because the boot loader cannot read it. 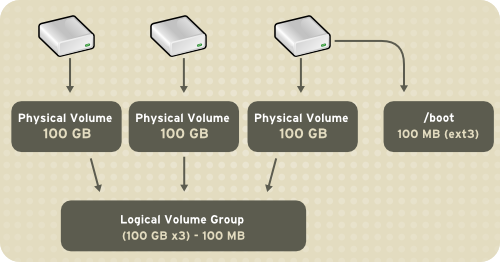 If the root (/) partition is on a logical volume, create a separate /boot partition which is not a part of a volume group. To learn how to configure LVM during the installation process, refer to Section 11.2, “LVM Configuration”.